The real trick in orchid care is to gain some experience and education and to be preventive with respect to problems. It really doesn't take much time or knowledge to keep them healthy. Frequently people write me and ask me to recommend resources or sources of information to learn about orchids. It is called Orchid Care for Easy Orchids Tips for Successful Care of Orchids. 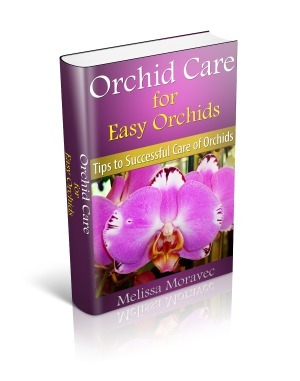 It is about 37 pages long and it is filled with a lot of great information on how to grow and bloom 5 kinds of "easy to grow" orchids. If you are interested contact me through the Orchid Contact Page. I will be putting it on Kindle in the next couple of days and can give you a link to purchase it there. Now let's look at what the leaves of the orchid can tell us about orchid health! Over the past 20 years the orchid supply has become almost limitless. Learning about leaf orchid care is becoming more important to all orchid lovers. Leaves can help you to diagnose what is wrong with your plant. This as one of the best ways to see the early signs of potentially fatal diseases. Leaves can be yellow, blackened or brown or they may become shriveled. Let's learn more about leaf orchid care and what to do. Blackened leaves show their effects on the body or the tip of the leaf. If it is on the body of the plant it is usually due to the hot sun causing a leaf to burn. Leaf orchid care would tell us that if this is the case then move the plant away from direct sunlight. If sun burn is not the cause and the size of the spots continue to grow then it may be a bacterial or fungal disease. If so cut off the affected part of the leave and treat it with a fungicide. What about blackened or brown tips of the leaf? This could be caused by excessive minerals in your water. This is fairly common in well water. With the leaf orchid care you should have your water tested. Consider using purer water like rain water. NEVER use water that has been softened with a water softener. The salts in the water can kill your plants. Brown tips could also be caused by excessive fertilizing, especially Cymbidiums or once again it could be a fungal infection. If it seems to become larger you need to cut off the affected part (using a new single edge razor blade). Cut the plant where the tissue is still healthy and discard the razor blade when finished. Then treat the plant with a fungicide. Leaves may also be mottled or streaked black or brown. They are telling us that this could be from a viral infection. Caring for orchids tells us to determine this special tests are needed and can be provided by your local agriculture experiment station. You will need to send in a leaf. As in humans, there is really not much for treating virus right now. Yellow leaves are probably the most common ailment we see. Good leaf orchid care would tell us that it just could be a natural phenomenon called old age. If it seems to be happening to the oldest leaves don't worry. It is just the older leaves dying off. On the other hand it could be from, too much light (most common), not enough nitrogen in the fertilizer or if the medium is primarily bark. Other causes include being subjected to low temps or loss of roots. Caring for orchids would suggest to first change the lighting and potential for low temps. Keep in mind that in the North being on a window sill during winter can be a cold spot. Another condition that you could see in orchids are small spots that turn from reddish brown to black. These are most likely caused by fungal infection. As orchid growers we need to remember that humidity is needed for proper orchid growth and the orchid supply. Too much humidity favors the growth of fungus. The last orchid care tip I want to mention is the shriveling of the pseudobulbs. Pseudobulbs are very efficient water storage areas of the plants. If there is not enough water given to the plants or the humidity is too low the leaves will shrivel. Also, if the root system is dying you can get shriveled pseudobulbs. Leaves tell us a great deal and the leaf orchid care helps to prevent the early diseases from becoming fatal to the plant.